Home > Special Articles > Magic Formula of Wealth Creation.. There is a Mr. A. Although he has always been particular & disciplined about money management, wealth creation has remained a distant dream for him. Despite noting down every expense for the past 20 years and ensuring that he saves something to put in his bank account, he has failed to figure out the reason why his Rs.2 lakh-a-month salary is not enough to create wealth. Like most of us, he blames the rising cost of living and curses the fact that he is not making enough money to live his dreams. He remembers the time when a family of four would go out for a movie and come home having spent not even Rs.100. And today, a family weekend at the movies will cost you nothing less than Rs.1,000. Mr. A is none other than R. K. Laxman’s common man; that common man who is working up a sweat to make money. No matter what, prices of products and services are rising and it is becoming difficult to keep pace. So, what options does a common man have? Does he compromise on his family’s lifestyle? Or look for another job? Or does he put money in equities in the hope of making a quick buck? Or should he stop dreaming about wealth creation? one of these would be necessary. Mr. A can create wealth by managing his personal finances better and ensuring that inflation and volatility become his friends in his journey towards wealth creation. 1. Beware of hidden tax inflation..! Inflation is mostly seen in a negative light. However, having good inflation is not necessarily a bad thing as it can indicate economic growth and the likelihood of assets appreciating. Thus, the real question is to figure out the assets that will appreciate more than inflation and deliver positive real rate of returns. If your assets are appreciating less than inflation, then you are losing money in real terms as the purchasing power of your money is depleting. Further, the diminishing value of currency makes the same amount of money incapable of purchasing as much. Historically, gold has been considered as store of value and a hedge against inflation. However, there have been periods when gold has given negative returns in spite of high inflation. Another favourite, fixed deposits, also hardly beat inflation especially post-taxation of interest income. Various studies show that equity has outperformed all other asset classes in the longer run and has also beaten inflation by a wide margin, thus giving a positive real rate of return, and the same done consistently over several years has led to compounding and wealth creation. The sooner we realise that risk and return go hand in hand, the faster our money will work for us. The safest way to keep money is probably in cash or in a savings account, but that would hardly lead to any kind of returns, and most importantly, doing so will make you lose the worth of your money. On the other hand, an asset class like equities can be volatile, but can give you better long-term returns. So, the best way to befriend volatility is to be disciplined and invest systematically and for the long term. A 10-15-year period of investing in equity can significantly improve chances of better returns, yet lower deviations or in other words, volatility. By being disciplined in investing systematically in equities through mutual funds, you make the best of both highs and lows which can eventually bring down the cost of acquisition. 3. Somethings work better in the long run..! It is high time we realise that as prices go up, savings alone will not do the trick. Investing in financial instruments that can sustain and grow the value of your money is probably the wisest choice. Over the years, long-term investments have displayed remarkable performance in both favourable and unfavourable economic circumstances. Thus, investing for longer periods in asset classes, like equity, which can beat inflation over the long term, is the best way to consistently get positive real rate of returns compounded, which in turn leads to wealth creation. Investing in equities systematically through vehicles like mutual funds brings down the risk of market volatility and concentration. 4. Magic formula of wealth creation..! The simple approach to wealth creation is to practice three things consistently. First, the purpose of investing is to beat inflation. Second, compounding for long term is the only magic that works for wealth creation. And third, asset allocation and systematic investments are the proper ways to compound. The secret to wealth creation, and beating inflation and market volatility is to invest in fundamentally sound equity assets through well-selected mutual funds using the monthly systematic investment plan route. Disciplined investing in the equity market will ensure that your personal finance does not suffer, irrespective of market volatility and high inflation. 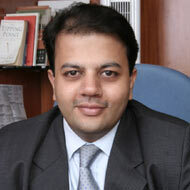 Mr. Rahul Parikh is Head at Aditya Birla Money My Universe.